I always think that the measure of a page is how quickly you turn it. So I’ll condense my critique of the recently released ‘Maximising the City's Potential: A Strategy for Intensification and Height’ on the future of high rise in Dublin by saying that I can’t believe it’s only 18 pages long. It’s as constipated as Proust. I’d almost say it’s worth the read for the inadvertently humorous part where it offers ‘technical’ definitions for ‘mid rise’, ‘high rise’ and ‘landmark’ buildings, but the rest of it - the part that says all buildings will be more or less six storeys tall everywhere except in strategically defined areas (i.e., run down, ex-industrial neighbourhoods where development is likely to occur with our without the Council) where taller buildings may be appropriate – is so careful to avoid clarity its almost cynical. Documents don’t come this vague by accident: someone somewhere put a lot of effort into making sure little was said. 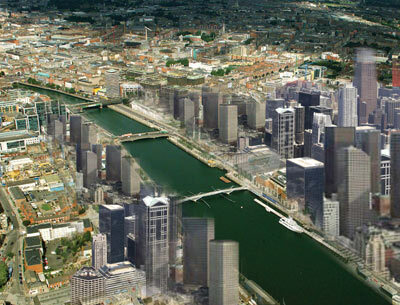 Think about it - a plan for future high rise building in Dublin which includes no diagrams, drawings or (meaningful) images (the ones included are deliberate cop outs) of what building tall might mean to the city? Also, in a report which is all to do with making an informed decision about an important aspect of the future of the city there is no reference, direct or hinted, to modern urbanist thinking. Conzen, Lynch, Jacobs, Appleyard, Alexander, The New Urbanists, Whyte, Faludi, Cherry, Reps, the Morphologists, the Portland City Plan, the Vancouver City Plan, the Borneo Sporenberg – serious thinkers, serious projects which, at the very least, the non architecture/planning public deserve to be informed about to some degree in a discussion about the future of their city, all conspicuously absent.